We do not know how exactly the magi travelled, though many artists depict them journeying atop richly decked-out camels, maybe silhouetted dramatically against desert dunes or a dusky starlit sky. 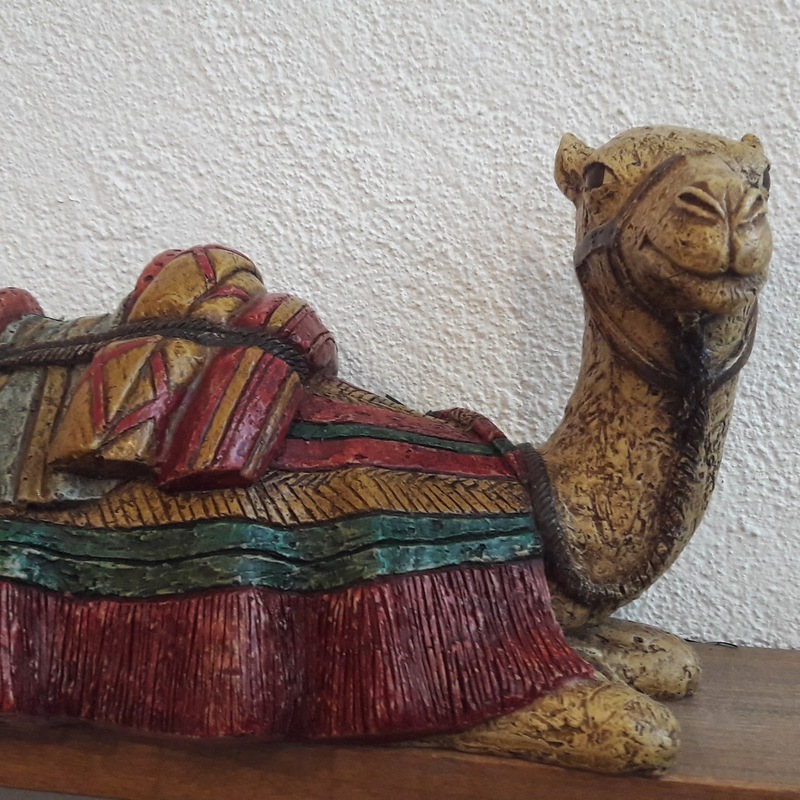 Camels are seen as an essential part of the journey, but not of its end - they are rarely, if ever, shown in Nativity scenes. And this, of course, is very logical: sheep and cattle can fit into and even belong in a stable or a cave; camels cannot and do not. They have done their duty but they must remain outside, debarred by the very size and weight which has made them such a good, steady means of carriage. Left out, literally and figuratively. Which brings me to this cheeky chappie. He belongs to some Holy Child sisters, whose congregational feast is today, and spends each Epiphany sitting near their crib, maybe warming himself above a radiator. I have a fondness for him - or rather, for that artfully satisfied look of his. He is, undoubtedly, the camel equivalent of the cat that got the cream - illicitly: not quite purring, but certainly hugging some secret mischief to himself. What, I wonder, has he been up to? Maybe he was curious; maybe he wasn't happy to hang around outside, but ambled up to the stable entrance and peered in... And beheld something at once ordinary and wondrous, tiny yet bigger than the entire universe... Beheld infinite Mystery, his owner in adoration and a Light to dispel all darkness. And now he sits, contentedly ruminating, blissfully sated and so, so pleased with himself for having given in to curiosity and going where no camel has ever gone before. That's my theory, anyway; what do you think? If he could, he'd definitely smile a bit broader at reading your blog. Yes, though it also helps to have a weird and vivid imagination!